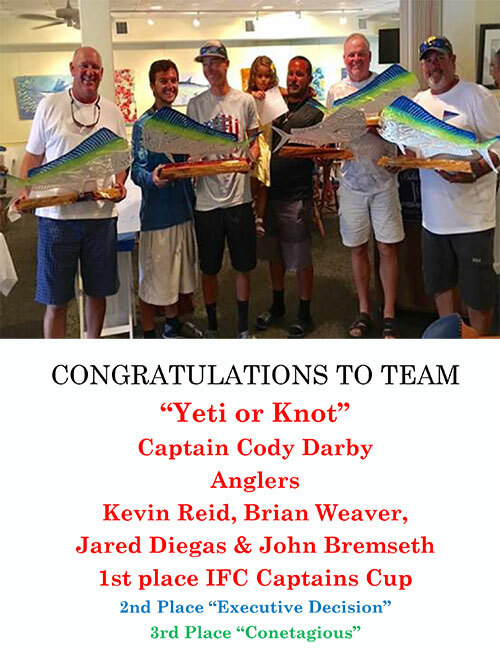 Congratulations 2018 IFC Sailfish Tournament winners! Anglers were greeted with beautiful weather on Thursday June 28 th for the 19 th Annual Islamorada Fishing Clubs Captain's Cup Dolphin Tournament. 13 boats with 44 anglers headed out to capture three big dolphin. It would be the largest combined weight of three fish that would be needed to win the tournaments $13,000.00 in prize money. When the scales closed at 5PM all the stories were the same. There were lots of fish out there but no big ones. It would be Captain T.J. Zinkand on his charter boat Live Action out of Robbie's Marina that would find the biggest dolphin. Angler Matt Klefeker from Florida City, FL would land a 21.8 pounder. TD Bank sponsored first place trophies would go to Matt and Juan Roman also from Florida City with two other fish that weighed in at 17.9 and 10.2 pounds for a total of 49.9 pounds. T.J. would receive the Caribee Boat Sales sponsored trophy and the Captain's Cup that was filled with donated gift certificates from many local businesses. Mate Jack Zinkand received the Yamaha Outboards sponsored mate's trophy and the team took home the big check. Second place team Linda Let Me, with anglers Bruce Halle of Layton, FL, Steve Leopold and Dianne Harbaugh from Tavernier, FL fishing with captain Bill Harbaugh would weigh in a 14.9, 11.1 and 6.4 pound fish. Second place trophies sponsored by Tackle Center of Islamorada, Regan Insurance, Dennis Ward and Mirna Hormechea would go to the team for their total of 32.4 pounds. Trophy Hunter's Captain Anthony Whitford would lead his team to a third place trophies sponsored by Forest Tec Lumber and anglers Mark and Bub Mitchells own company, Barker Mitchell plumbing Company from Charlotte NC. The team would fish with angler/mate Brett Shalaminan and weigh in a 12.6, 10.3 and 8.1 pound dolphin for a total of 31.0 pounds. 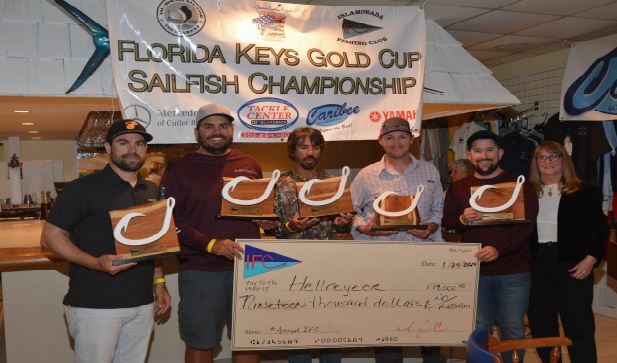 "The Islamorada Fishing Club put on an amazing show," stated tournament director Dianne Harbaugh. Angler gifts and ditty bags loaded with SWAG were handed out on the kick off night. Islamorada Beer Company was in attendance and serving up drinks filled with their new spirits being brewed right here in Islamorada. Fantastic appetizers followed by a dinner buffet awaited all the anglers and guests. The awards ceremony on Thursday evening was filled with amazing appetizers followed by a huge surf and turf dinner and finished off with a Key Lime pie. All the anglers and captains are excited and ready to be a part of next year's event which will be the last Thursday in June. 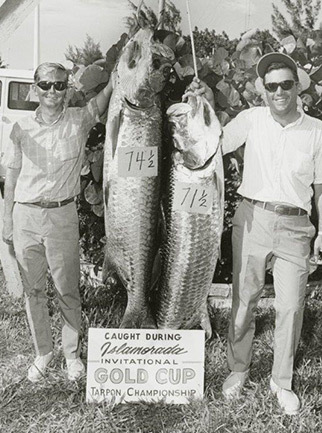 For more information on the tournament and the Islamorada Fishing Club, call the club at 305-664-4735.